Measurements: 2.38 x 3.78 inches, or 60 x 96 mm. Back of card: Green swirls on a white background. May be inverted, though I don't know if this deck is typically inverted. Booklet included: Yes, 32 pages, 2.4 x 3.78 inches, or 62 x 96 mm. Instructions in English, Italian, Spanish, French & German. 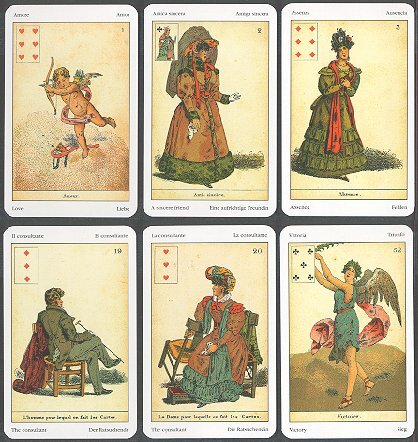 Comments: This is essentially a 52 card playing deck (note small images of hearts & spades & clubs & diamonds, above), without Jokers, but with descriptive characters & text on each. The deck appears to be a reproduction of a 19th century French deck, but the notes enclosed with the deck give no information as to its origins. Each of the original cards has a French title or phrase at bottom center. The Italian, Spanish, English & German keywords, in the four corners, are based on it, though I think the original French are best of all. Shuffle, draw four cards, lay them out in a square. Start with the upper left hand corner, deal 16 more cards - as if you were dealing a round of cards to four players - on top of the four initial cards, in a counter-clockwise direction, face down, for a total of four stacks, each with five cards. The five cards in the upper left "hand" represent money & business. The bottom left five represents health, the body, and chance encounters. The bottom right five represents work & professional activity. The top right five represents love & relationships. The first card dealt in each stack represents the current state of affairs. The last card in each stack is the ultimate outcome. There is a fifth stack of cards, built on how many cards of each suit are found in any of the other four stacks. This 5th stack, 0-4 cards, represents the overall synthesis, or outcome. The booklet promises great predictive power if these rules are followed closely. I thought of another method, one much simpler. Divide the cards into three piles. One of people, one of objects, and one of verbs. Shuffle each pile, draw one card from each, read the result. For example, The Consultant. Waiting. Victory. Which becomes: The consultant is waiting for victory, or, perhaps, Victory is waiting for the consultant. Notably, there are NO INDIVIDUAL CARD DELINEATIONS	given in the booklet. You have to figure the cards out on your own. In addition to ordering the cards by number & suit, there is a secondary numbering system in the upper right hand corner. These were the first numbers I saw when I opened the cards, and as they appeared to be in no order, I promptly ordered them according to those numbers. Later I saw the traditional card faces in the upper left corner, but by then I could no longer establish the original order of the cards.